On January 26, 2019, the Hood Museum of Art at Dartmouth opened the doors to its renovated and expanded facility. 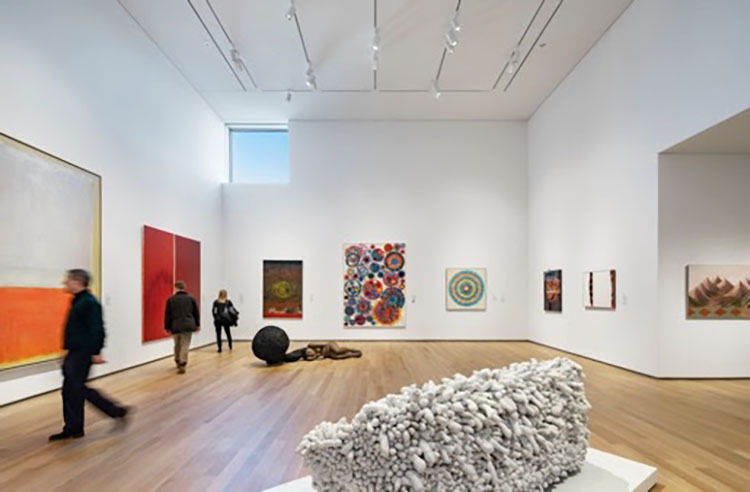 Designed by Tod Williams Billie Tsien Architects| Partners (TWBTA), the expanded museum ties together the College’s academic and research priorities with an emphasis on the arts at Dartmouth. The Hood sits at the heart of Dartmouth’s campus on the historic Green. The museum’s central location signifies the importance art plays in the Dartmouth experience. The Hood’s encyclopedic collection is one of the largest of its kind in the United States, comprising more than 65,000 works spanning a variety of media and historical periods. The renovation and expansion ensures that these works of art will be preserved, seen, and utilized by students, faculty, and visitors from around the globe. The building is a hybrid of newly constructed facilities and restored and updated spaces from the original 1985 Charles Moore building, and provides active spaces for teaching, exhibition, exploration, and dialogue. It also redirects traffic on campus, creating a central artery facing the Dartmouth Green with a walkway through the museum to the campus arts district. The impetus for the expansion was an increased demand from students and faculty to gain deeper access to the Hood’s collections through more and improved galleries and classrooms. This was coupled with the understanding that a purposefully expanded museum presents opportunities for greater engagement by all of the museum’s audiences.The newly constructed building is seamlessly interwoven with the historic Moore structure and brings the entire museum up to today’s codes while updating the original galleries to new environmental and conservation standards. Specifically, the expansion increases the Hood’s exhibition space by 42 percent to 16,350 square feet, adds three classrooms with the latest object-study technology—tripling the number of student classroom visits the museum can host—and increases the total number of galleries from 10 to 16, with the addition of six new galleries. The expansion also increases the Hood’s overall square footage by more than 50 percent, to 62,400 square feet. The project budget for the renovation and expansion is $50 million, which has been raised through private donations.